Russia and India have agreed to assemble 400 twin-engined helicopters a year in India, Russian Deputy Prime Minister Dmitry Rogozin said after summit talks between President Vladimir Putin and Prime Minister Narendra Modi. The Kamov Ka-226T, which Russia offered to assemble in India, is a light multi-role helicopter which is used for search-and-rescue operations. The issue was discussed during the summit talks between Prime Minister Narendra Modi and Russian President Vladimir Putin. According to Russian Deputy Prime Minister Dmitry Rogozin, almost 400 Kamov helicopters a year will be assembled in India. He said Russia may consider producing Mi-17 transport helicopter in India as well. At a joint media interaction with Putin, Modi said they discussed a broad range of new defence projects and how to align the defence relations to India’s own priorities, including ‘Make in India’. “I am pleased that Russia has offered to fully manufacture in India one of its most advanced helicopters. It includes the possibility of exports from India. It can be used for both military and civilian use. We will follow up on this quickly,” Modi said. The Prime Minister said Russia has been India’s foremost defence partner through decades and it will remain so. “Even as India’s options have increased today, Russia will remain our most important defence partner. We have conducted joint exercises across all three wings of the Armed Forces in the last six months,” he said. 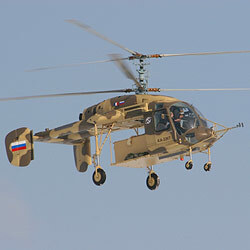 Russian officials said an in-principle decision was made on assembling of Russian helicopters in India. “Almost 400 Kamov helicopters a year will be turned out,” Interfax news agency quoted Rogozin as saying.